A 550-Year Record of the Disturbance History of White Spruce Forests Near Two Inuit Settlements in Labrador, Canada Natasha Roy1,*, Najat Bhiry1, James Woollett2, and Ann Delwaide1 Abstract - We assessed historical variations in environmental parameters affecting tree growth during the last 550 years in north-central Labrador, Canada, using dendroecological analysis of white spruce forests near two Inuit settlements. Tree surveys of both modern and archaeological wood samples provided data for dendroecological analysis of growth patterns and natural and anthropogenic disturbance regimes and enabled more-refined dendrochronological dating of the occupation of archaeological sites. Previous Quebec-Labrador peninsula dendroecological studies have focused on climatic forcing agents; this study’s coupling of annual tree-growth records to local-scale historical and archaeological data facilitates examination of multi-causal disturbance patterns over time. Low-intensity human interactions with forest ecosystems were significant factors influencing local-scale subarctic forest dynamics in coastal Labrador and should be taken into consideration in other studies. 1 Centre d’études nordiques and Département de géographie, Université Laval, Québec, G1V 1A0, Canada. 2Centre d’études nordiques and Département des sciences historiques, Université Laval, Québec, G1V 0A6, Canada. *Corresponding Author - natasha.roy.1@ulaval.ca. Introduction Several recent studies have used the association of variable tree-growth patterns with particular environmental parameters as a cue for assessing the large-scale effects of past and present climate on boreal forest ecosystems (e.g., Caccianiga et al. 2008). In Labrador, Canada, tree-ring analyses have been widely used as proxies for climatic conditions such as temperature and for the teleconnections between the atmospheric, oceanic, and sea-ice forcings that structure the climate system (e.g., D’Arrigo et al. 2003, Dickson et al. 1996). Several studies have also examined climatic influences on Labrador’s forests at both local and regional scales, indicating that tree-ring growth records are sufficiently sensitive to record local effects of large-scale atmospheric variations such as the North Atlantic Oscillation (NAO) (e.g., D’Arrigo et al. 2003, Overpeck et al. 1997, Payette 2007). These studies have demonstrated the complexity of the relationship between tree growth and climatic parameters. Very little attention has been paid, however, to the use of dendroecology to identify factors influencing tree growth at the local scale, particularly in relation to forest-disturbance processes such as insect outbreaks or fires. In the present study, dendroecological approaches identified significant forest disturbances in areas having prolonged Inuit settlement. While these disturbances appear to be highly localized in the spatial scale, they nevertheless had measurable impacts on the evolution of the forest cover as demonstrated by the frequency of identifiable release events. Dendroecology measures historical variations in radial-growth rates to analyze the impact of environmental changes on tree growth, stand structure, and stand dynamics (Fritts and Swetnam 1989). Recently, dendroecology techniques have become more important for identifying and documenting historical disturbance regimes in forest stands (Rubino and McCarthy 2004). As illustrated by Nowacki and Abrams (1997) and Payette (2010), tree-rings represent very useful datasets for describing disturbance regimes, especially long treering series from forests that have undergone minimal anthropogenic disturbance. According to Rubino and McCarthy (2004), a disturbance represents an event of massive mortality in a community of living organisms. However, a disturbance may also be seen as a positive process mobilizing vital resources (e.g., light, water, and nutrients) to the benefit of survivors or new colonizers that leads to local invigoration of growth (Canham and Marks 1985). Disturbance events may be endogenous (i.e., pertinent to growth dynamics of individual stands) or exogenous (i.e., resulting from factors originating outside the stand) and may greatly influence radial-growth rates (Cook 1987). At the regional scale, a disturbance is usually manifested by the development of canopy-gaps due to windfall, wood harvesting, fire, insect outbreaks, or similar events. The presence of a canopy gap induces a release event, a rapid increase in radial-growth in nearby trees that had previously been living in a state of surcimage, i.e., in the absence of light. Disturbance-history regimes may be reconstructed by identifying growth-release events manifested in radial-growth patterns (Nowacki and Abrams 1997, Payette 2010). These methods provide an objective 2017 Journal of the North Atlantic No. 31:1–14 2017 Journal of the North Atlantic No. 31 N. Roy, N. Bhiry, J. Woollett, and A. Delwaide 2 representation of past disturbances when release events are identified according to pre-determined criteria (mean ring-width, percentage growth rate, etc. ; Rubino and McCarthy 2004). In order to document anthropogenic forest disturbances and their impacts in north-central Labrador, we conducted dendrochronological investigations in 2 isolated forests surrounded by coastal barrens in the Nain Bay and Okak Bay regions. These studies were undertaken in conjunction with ongoing archaeological research at Inuit winter settlements (Oakes Bay 1 [HeCg-08] on Dog Island and Uivak Point [HjCl-09]) within or adjacent to the forestry study areas (Fig. 1). Arctic and subarctic environments are stereotypically considered to be pristine natural environments lacking anthropogenic disturbances. However, various aboriginal populations, including Maritime Archaic, Paleo-Eskimo, and Neo-Eskimo, have called Labrador home during the last 7000 years. All of these peoples have transformed, even if only subtly, the surrounding environment in which they lived by exploiting the available natural resources. Wood was one of the most important plant resources in terms of its diverse and essential roles in daily life (fuel, raw material, medicine; see Alix 2005) and the volume in which it was consumed. Wood has been an essential resource for Inuits, used as fuel and as raw material for fabricating material culture essential in everyday life such as houses, sleds, boats, and tools, both prior to and following the advent of extensive European contact. According to Kaplan (2012) and Lemus-Lauzon et al. (2012), wood use in the Nain region has changed and adapted to evolving socio-economic conditions accompanying the expansion of the European colonial presence in Labrador. Once centers of colonial exchanges were established in north-central Labrador, such as the first Moravian mission settlements in 1771–1783, Inuit resource harvesting became increasingly oriented towards supplying these European bases and markets in exchange for trade goods (Brice-Bennett 1977, Kaplan 1983, Kleivan 1964). By the 19th century, harvesting wood from forest stands in the territories around Moravian settlements, destined for use as fuel and building materials, became one of the local resources Inuits contributed in their market exchanges (Kaplan 2012). Inuit wood harvesting had measurable impacts in locales distant from European bases as well. For example, paleo-ecological data published in a recent study (Roy et al. 2012), revealed that the inhabitants of the Oakes Bay 1 (HeCg-08) winter village had considerable impact on the local forest. The discovery of several cut tree-stumps buried in peat, coupled with analysis of spruce macrofossils recovered at the site indicate that, prior to its 17th-century occupation, the site had a cover of spruce trees (Picea). By late 20th century, the perimeter of the site was almost entirely unforested, likely due at least in part to cutting for building materials and fuel. Today, the site is an open peat bog with scattered small stands of spruce and larch, and widespread subfossil spruce remains preserved in peat. Surrounding the site is an open spruce forest that contains numerous subfossil spruce stumps bearing traces of cutting with axes and saws. Given the long history and broad application of Inuit wood harvesting in Labrador, it is necessary to identify the source of disturbances on isolated forest stands such as those at Oakes Bay . Methods Physical setting This study was conducted in the vicinities surrounding 2 archaeological sites located on Dog Island and Okak Bay in north-central Labrador (Fig. 1). The study area lies in the Coastal Barrens ecoregion of the Labrador coast, which extends from Napaktok Bay south to the Strait of Belle Isle (Government of Newfoundland and Labrador 2013). The majority of the central Labrador coast is characterized by broad bays and long inlets separated by prominent capes and headlands and screened by clusters of islands. Within the sheltered bays, summers are cool to warm and the growing season is 100 to 120 days (days with temperature over 0°C) (Government of Canada 2015). Average annual temperature from 1985 to 2012 was approximately -2.4 °C and annual precipitation was about 900 mm, of which about 50% falls as snow (Government of Canada 2015). The dominant vegetation type is Empetrum barrens, with black spruce (Picea mariana [Mill.] Britton et al.) and white spruce (Picea glauca [Moench] Voss) forests occurring in sheltered valleys. White spruce established itself in north-central Labrador ~6000 years ago in the Nain area, by ca. 3000 B.P. in the Dog Island area, and 4500 years ago in the Okak Bay area, but declined after 2500 B.P. (Lamb 1985, Roy et al. 2012, Short and Nichols 1977). At sites favorable for spruce, trees 100 to 250 years old are common, while trees 250 to 300 years old may be frequently found in protected and sheltered areas untouched by insect outbreaks and fire, such as islands and the Nordic region (Zasada 1984). Oakes Bay 1 (HeCg-08), Dog Island: Dog Island is part of the archipelago of Nain Bay (Fig. 1). This island is located 35 km from Nain, which is currently the largest Inuit community in Labrador, with 1188 inhabitants (Statistics Canada 2012). The Oakes Bay Journal of the North Atlantic 3 2017 No. 31 N. Roy, N. Bhiry, J. Woollett, and A. Delwaide 1 archaeological site (HeCg 08), historically known as Parngnertok (Taylor 1974), is located on a marine terrace 6 to 8 m above sea level (asl) in a small bay located on Dog Island’s western shore. Just north of the site is the steep and cliffy southern slope of Mount Alagaiai that shelters the bay. The slope from about 8 to 180 m asl is colonized by an open forest of white spruce (Fig. 1). According to Zasada (1984), relatively wet upland conditions such as those of Oakes Bay are favorable sites for the development of old-growth spruce forest. The archaeological site Oakes Bay 1 includes the ruins of 7 semi-subterranean sod houses of various sizes. Their floors were dug into sand substrate and their superstructures were built of stacked blocks of peat, piled earth, and rock, with wood beams and posts, as was typical of semi-permanent Inuit sod houses used in winter (Woollett 2010). According to the results of archaeological investigations conducted to date, 2 successive phases of construction and occupation of sod winter houses can be dated from late 17th century to early 18th century, and from mid- to late 18th century (Woollett 2010). Nevertheless, the immediate locality also has a number of tent rings and artifact distributions that demonstrate an ongoing and diverse occupation (apart from the sod houses themselves) stretching from over 2000 B.P. to the 20th century. Historical mention of the site’s sod houses was made in a census taken by Moravian missionaries during their first winter in the Nain region (A.D. 1771–1772). This document (summarized by Taylor 1974, Taylor and Taylor 1977) reported the use of a single house during that winter, but made no further note of the use of the sod houses afterwards, even though subsequent tent camps were reported in the vicinity. While Oakes Bay 1 seems to have been abandoned as an intensively occupied semi-permanent winter village before A.D. 1780, other winter or year-round settlements were in use on and around Dog Island throughout the 19th century and up until the 1970s (Woollett 2003). Uivak Point (HjCl-9): The archaeological site of Uivak Point (HjCl-09) is located on the northern shore of Okak Bay (Fig. 1) about 125 km north of the village of Nain. The site is 8 km north of the village of Okak, which was established by Moravian missionaries in A.D. 1776 and then abandoned in A.D. 1919 following the catastrophic outbreak of Spanish flu (Taylor 1974). The dominant vegetation type surrounding the archaeological site is low arctic tundra, while white spruce occurs sporadically in circumscribed groves of 3–10 trees. The Uivak Point locality has seen repeated occupations in prehistory and during the recent past. Several surficial distributions of chipped stone tools and tent structures found in the vicinity relate to as yet poorly defined occupations ranging from the Maritime Archaic (5000 to 3500 B.P.) to Intermediate Indian populations (3500 to 2000 B.P. ), and Pre- Dorset (3800 to 2200 B.P.) (Cox 1977). Thule/Inuit used the location on a repeated basis during the 18th, 19th, and 20th centuries (Kaplan and Woollett 2000, Taylor and Taylor 1977). The Uivak Point site is a winter settlement comprising the ruins of 9 semi-subterranean sod houses constructed on a slope between two boggy terraces 8 and 11 m asl, respectively (Fig. 1). According to Moravian records, Uivak Point was one of the most important winter settlements in Labrador during the late 18th century and the opening years of the 19th century; it had up to 125 occupants in some years and was regarded as one of the more successful whaling communities in Labrador (Kaplan and Woollett 2000, Taylor 1974, Taylor and Taylor 1977). Archaeological excavations suggest an initial occupation of some of the sod houses by the mid-18th century at the earliest and, according to Taylor and Taylor’s (1977) synthesis of Moravian census records, the sod-house site was occupied every winter between 1776 and 1798 and again between 1800 and 1807. No mention of a subsequent use of the sod houses is reported, although there were tent camps established there in all seasons certainly as late as 1829. Several groups of tent rings of uncertain date but lacking chipped stone tools distinctive of prehistoric populations are visible around the locality. As well, the foundations of 2 more-recent cabin structures with stone foundations are located on the shore of the cove adjacent to the sod house site. While the dates of these houses’ initial occupations are not known, they were used until 1918 (The survivors … 1986). Dendroecology analysis We studied growth patterns of white spruce stands around Oakes Bay 1 and Uivak Point in a pair of field sampling surveys conducted in July–August 2010. A total of 154 trees were sampled. From living trees, 2 cores taken perpendicularly were collected using a Pressler increment borer at about 25 cm from the root indent collar. Cross-sections were taken, using a saw, from dead trees at root collar. At Dog Island, the sampling was carried out near Oakes Bay, over a 2-km length comprising twenty 10-m-wide transects spaced every 100 m (Fig. 1). Each individual tree and krummholz (an area of stunted windblown trees growing at high elevations on mountain slopes) observed along each 10-m-wide transect was measured and recorded, but only those having a diameter greater than 15 cm were sampled 2017 Journal of the North Atlantic No. 31 N. Roy, N. Bhiry, J. Woollett, and A. Delwaide 4 Figure 1. Location of the study sites of Uivak Point (upper map) a n d O a k e s Bay, Dog Island (bottom map). In both maps, black l ines show transect sampling for the study. Journal of the North Atlantic 5 2017 No. 31 N. Roy, N. Bhiry, J. Woollett, and A. Delwaide in order to have a minimum number of 80 growth rings in each core. For dead trees, each stump that could be harvested (i.e., was not buried or decomposed) was sampled. A total of 133 samples were recovered, including 41 core samples of living trees and 92 dead-wood sections. In addition, 4 pieces of spruce wood exposed during the excavation of House 2 at the Oakes Bay 1 archaeological site were collected for analysis. At Uivak Point, the survey area was defined following the discovery of old stumps that had been cut with an axe in a valley 500 m north of the archaeological site (Fig. 1). Unlike the Dog Island study area, this region includes only very scattered solitary trees and small isolated tree stands. Given the low density of forest cover, all trees that could be sampled according to the same criterion given at Oakes Bay were selected, including krummholz. A total of 15 core samples and 6 dead-wood sections were taken. Nine spruce trunk specimens were recovered from sampling trenches excavated in Houses 6 and 7 in the Uivak Point archaeological site. A tamarack (Larix laricina [Du Roi] K.Koch) beam from the roof of the entrance passage of House 6 that had been extracted from permafrost proved to be sufficiently well-preserved across the breadth of the trunk to justify dendroecological analysis. Diagnostic light rings, i.e., growth rings with exceptionally few latewood cells, were used to date and cross-date living- and dead-wood sections (Filion et al. 1986). Archived light-ring chronologies derived from the L2 tree-ring sequence (1680–1922) from Okak Bay compiled by Serge Payette and from Oakes Bay on Dog Island (1620–1978) compiled by Natasha Roy, available at the Dendrochronology Laboratory at the Centre for Northern Studies (CEN), Laval University, were also used as validation tools. These series allow us to determine the approximate age of the archaeological wood samples. Cross-dating was also verified using the program COFECHA (Grissino-Mayer 2001, Holmes 1983). Tree-ring widths were measured with a Velmex micrometer (precision of 0.002 mm) under a binocular microscope at 40x. We retained only highly intercorrelated individual curves to build the chronologies of the Oakes Bay and Uivak Point tree-ring records. In dendroclimatology, response-function analysis is used to define the correlation between ring width and particular climatic variables such as temperature. Temperature data from the Goose Bay weather station (Government of Canada 2013) were used for the calculation of response functions, in particular mean monthly temperatures during the current year and the past year from September to December. Weather data from Goose Bay station was preferred to data from the nearby Nain stations since it is more extensive. The CALROB program from the PPPHALOS package (Guiot 1990) was used to calculate response functions of white spruce growth to climatic parameters at Oakes Bay and Uivak Point. The bootstrap method (Efron 1979, Guiot 1990) was used for the response functions based on the repetitive calculation (500 simulations) of multiple regressions on the same set of climatic variables. In this study, response functions were calculated following the methods described by Guiot and Nicault (2010). Disturbance-events analysis: In Hudson Bay, Delwaide and Filion (1987) identified and dated anthropogenic disturbances such as wood harvesting in areas occupied by aboriginal peoples using dendroecology methods. According to Payette (2010), the relative growth of tree growth rings can be used to identify and date the presence of canopy-gaps between trees in a state of surcimage . Growth releases were detected for individual trees by calculating the ratio of the width of individual growth rings relative to those of the 10 preceding and succeeding years (Berg et al. 2006, Caccianiga et al. 2008, Nowaki and Abrams, 1997, Payette 2010). A growth release was defined as a percentage growth change exceeding 25% over 10 years. Afterwards, the total growth releases of each tree were arranged in 10- year classes. Percentage growth change (% GC) was calculated in yearly increments across individual tree-ring chronologies. Each % GC value represents a 20-year span of ring-width data, and empty cells relative to source tree-ring chronologies occur at both ends. Our data showed that growth releases were recorded as far back as A.D. 1500. However, old-tree samples (those 300 years old and older) are rare (5 of 154), since many of the old trees were too decomposed to analyze or were buried. This limitation may cause an underestimation of disturbance-event frequency. Consequently, the low number of disturbance events in the age-characteristic structures of each site was corrected using log-linear regression (Morneau and Payette 2000). However, this analysis assumes a constant decrease in disturbance events over time. That is why we expressed the fluctuations in the number of disturbance events by using the curves of the regression residuals. This approach required that we add a disturbance event to each of the age classes for disturbance because of the sporadic occurrence of years where no events were noted and the fact that logarithmic transformation is inapplicable when the value is 0. 2017 Journal of the North Atlantic No. 31 N. Roy, N. Bhiry, J. Woollett, and A. Delwaide 6 We did not have a control site (i.e., a non-disturbed site), but we observed logged stumps throughout the area during initial surveys in the study region. The site studied by Payette et al. (1985) has not been subject to major natural disturbances and thus could be regarded as a control site. This site also has similar ecological characteristics, such as old spruce trees and the absence of fire disturbance, to the study sites but is located on the mainland. Occurrence of insect outbreaks: In northeastern Canada, the impact of insects on the dynamics of the forest ecosystem is largely unexplored, and very little is known about insect outbreaks in Labrador. Nishimura (2009) has reconstructed the history of larch sawfly (Pristiphora erichsonii (Hartig)) and spruce budworm (Choristoneura orae Freeman) outbreaks in western Labrador but, to our knowledge, no spruce bark beetle (Dendroctonus rufipennis Kirby) outbreak has been documented except for one mentioned by Payette (2007). That outbreak caused a dieback of white spruce in northern Labrador between 1989 and 1991. According to Payette (2007), the spruce bark beetle may also have played a significant role in the past. For example, in western North America, massive outbreaks of bark beetles have infested conifer forests creating extensive mortality of spruce (Berg et al. 2006). Accordingly, bark beetle outbreaks represent an important source of disturbance and must be considered in a study evaluating anthropogenic impact on forest disturbance. In this study, spruce bark beetle damage was assessed by direct observation of white spruce trees, with a focus on the presence of holes and galleries in the bark. Previous bark beetle attacks were counted and dated by recording resin pockets and blue-stain fungi visible in the wood sections and borer samples. Resin pockets are crescent-shaped resin accumulations that can be found either between two annual rings or within a ring, which is usually deformed (Caccianiga et al. 2008). Results Tree-ring width analyses The overall forest composition at both sites is indicative of a rather stable population in terms of size and structure (Fig. 2). The average age of trees in the two study areas is 180 ± 55.12 on Dog Island and 163 ± 61.46 at Uivak Point. Figure 2 shows the distribution of tree establishment by year. The forest increased in size after 1780 on Dog Island because many individual trees appeared after that date. At Uivak point, the distribution of tree establishment remained fairly constant over time. Both woodlands are old-growth stands with trees of all sizes and ages, including several 300-yearold white spruce specimens, with the oldest being 384 years old. Spruce mortality (as represented by sampled dead-wood sections) occurred more or less throughout the last hundred years in the two study areas and in particular between 1970 and 2000. The oldest dead white spruce trees sampled were established in 1518 and 1666 for the Dog Island and Uivak Point sites, respectively. The chronologies extended from A.D. 1518 to 2009 for Dog Island and from A.D. 1666 to 2009 for Uivak Point. Mean tree-ring width was similar among the chronologies (0.312 and 0.263 mm, respectively; Table 1). The Dog Island white spruce chronology, spanning A.D. 1518 to 2009, is one of the longest and oldest presently available in the Nain area, comparable to those of D’Arrigo et al. (2003) from Salt Water Pond (AD 1526–1998) and Eyeglass Lake (AD 1459–1960). It is also, at present, the easternmost white spruce chronology for North America and the only one from an island environment. The response functions of white spruce to climatic parameters show that tree growth at Dog Island is positively influenced by July mean temperatures (Table 2). At Uivak Point, response function analyses were insignificant. This result is probably due to the small number of samples at Uivak Point (21 samples) as compared to Dog Island (133 samples). When the number of samples is small, there is less chance that the correlation coefficient is high enough Table 1. Characteristics and statistics of tree-ring series from Dog Island and Uivak Point. Parameter Dog Island Uivak Point Mean ring width (mm) ± SD 0.312 ± 0.12 0.263 ± 0.17 Sensitivity 0.23 0.22 First-year autocorrelation 0.72 0.91 Original time series 1528–2009 1666–2009 Expressed population signal 0.94 - Table 2. Response functions data set for the mean monthly temperatures during the current growth year and the past year (from September to December). * indicates significant response functions Weather Sites Sept . Oct. Nov. Dec.. Jan. Feb. Mar. Apr. May Jun. Jul. Aug. station Dog Island -0.442 0.211 1.152 -2.162 -1.548 -0.881 -2.253 -1.181 -0.556 1.210 5.253* 1.244 Goose Bay Uivak Point -1.353 0.414 1.268 -2.830 -0.483 -0.739 -1.562 -1.356 0.225 1.172 2.306 1.458 Goose Bay Journal of the North Atlantic 7 2017 No. 31 N. Roy, N. Bhiry, J. Woollett, and A. Delwaide Figure 2. Distribution over time of tree establishment that composed the forest structure at Dog Island and Uivak Point. Note that data for the last 100 years are missing due to the sampling methodology (trees smaller than 15 cm diameter were not sampled). to confirm a significant correlation with the temperature data. In general, mean ring widths showed that tree growth was generally low throughout the period represented by the chronology (Table 3). However, the 2 records also indicate that growth rates were not constant over time and there were short periods of notable growth. Mean ring widths for 50-year intervals at Dog Island show that growth rates were low (below average) during the periods of A.D. 1551–1600 and A.D. 1651–1800 (Table 3). At Uivak Point, periods of below-average growth were noted during the 18th and 19th -centuries. Furthermore, at Table 3. Mean ring width of white spruce for 50-year time periods at Dog Island (DI) and Uivak Point (UP). Mean ring width for Dog Island is 0.312 ± 0.12 and Uivak Point is 0.263 ± 0.17. Mean ring width (mm) 1518– 1551– 1601– 1651– 1701– 1751– 1801– 1851– 1901– 1951– Site 1550 1600 1650 1700 1750 1800 1850 1900 1950 2009 DI 0.320 0.230 0.324 0.265 0.230 0.292 0.308 0.332 0.399 0.548 ± 0.17 ± 0.10 ± 0.17 ± 0.12 ± 0.11 ± 0.14 ± 0.16 ± 0.17 ± 0.22 ± 0.33 UP 0.209 0.211 0.216 0.201 0.268 0.413 0.502 ± 0.07 ± 0.14 ± 0.12 ± 0.10 ± 0.26 ± 0.30 ± 0.15 2017 Journal of the North Atlantic No. 31 N. Roy, N. Bhiry, J. Woollett, and A. Delwaide 8 both sites, mean ring widths increased during the 20th century, and the growth rate of younger trees increased markedly in this century in contrast to the growth rate of older trees, which was still low. However, at both sites and throughout the chronologies, the mean standard deviation of mean ring width is consistently high, which indicates that values are widely scattered around the average and that growth rates of individual trees were not uniform over time. This finding suggests that neighboring trees had variable growth-release events in response to forest disturbances. Moreover, dendrochronological dates obtained from wood pieces extracted from House 2 at the Oakes Bay site and House 6 at Uivak Point demonstrate evidence of wood-cutting activities corresponding to the timing of the these forest disturbances, although they do not indicate the extent of wood-harvesting activities (Table 4). Dendroecology Growth release. Growth-release episodes occurred with high frequency at Dog Island and Uivak Point. At Dog Island, 70% of the trees sampled showed a minimum of 1 growth release. At Uivak Point, 62% of trees sampled showed a minimum of 1 growth release. The highest frequency of growth releases for both sites was recorded at the beginning of the 20th century (Figs. 3, 4). Prior to that, growth releases were infrequent, with a small increase around A.D. 1760 at Dog Island. Between A.D. 1580–1640 and 1690–1760, disturbance events occurred (Fig. 3). Even though their frequency was low, growth release events extend far back in time to the 16th and 17th centuries (Fig. 3). Such a finding is noteworthy because it indicates that forest disturbance is an important process that has influenced forest dynamics since 1600 AD. In addition, there is a close time correlation between the positive residual values and these disturbance events. However, it must be noted that the first and last 10-year periods of each chronology must be excluded in the running mean methodology used in this study. Long-term reduction in the number of growth releases with age: Age–frequency distributions of growth releases at both sites were characterized by an exponentially decreasing trend over the last 320 and 490 years recorded at Uivak Point and Dog Island, respectively. According to the residual curve, it seems that the same trends in the frequency of growth release over the last centuries apply to both sites (Figs. 3, 4). In fact, the residual oscillation around the zero value indicates that the frequency of growth release increase was sustained. Resin pockets and blue-stain fungi: Resin pockets and blue-stain fungi, signs of spruce bark beetle infestation, were observed at least once in 35 samples from Dog Island, typically from rings dated after A.D. 1790. Trees on Dog Island show high concentrations of these marks in A.D. 1800, 1910, and 1920, with a clustered distribution at the end of the 19th century and the beginning of the 20th century. No resin pockets were found after A.D. 1960. Blue-stain fungi were observed with the highest frequency between A.D. 1970 and 2000; dates that also coincide with a period of significant tree mortality. Most of the blue-stain fungi were observed in the outermost part of the wood often associated with holes and galleries in the bark of recently dead trees. However, they were also found inside the wood, indicating that the trees had survived previous bark beetle outbreaks. Discussion Using the tree-ring chronologies developed in this study, we documented forest-disturbance events that occurred with increasing frequency and scale over time. These events were inferred from tree growth releases that occurred when the canopy opened causing reduced competition for resources (e.g. light, growing space) and considerably modified local growth conditions. These disturbance events appear to be less frequent prior to A.D. 1750 on Dog Island, possibly due to the scarcity of preserved old trees (which may have been decomposed or buried). A general increase in disturbance events was noted on Dog Island between A.D. 1750 and 1800, and disturbance events continued to have a frequent and consistent impact upon forest dynamics thereafter. Disturbance events reached their highest frequency after A.D. 1900 and have remained high since then. The causes of such events may include climate, fire, insects, and human activity. Climate and forest composition and structure As has been suggested by Berg et al. (2006), a 10-year mean window for evaluating releases is long enough to smooth periodicity in ring-widths associated with the El Nino-La Nina cycle, which Table 4. Dates from archaeological wood pieces. Borden Code Site House ID Species Date HeCg-08 Dog Island H2 545 Spruce sp. 1634–-1764 HeCg-08 Dog Island H2 OB-1 Spruce sp. 1616–-1741 HeCg-08 Dog Island H2 OB-4 Spruce sp. 1687–-1731 HeCg-08 Dog Island H2 OB-11 Spruce sp. 1618–-1681 HjCl-09 Uivak Point H6 Tamarack 1720–-1825 Journal of the North Atlantic 9 2017 No. 31 N. Roy, N. Bhiry, J. Woollett, and A. Delwaide Figure 3. Correlation diagram for the last 500 years at Dog Island: (a) occupation periods of the site and surrounding area; (b) cold climate periods (gray bars) from Meese et al. (1994) and Overpeck et al. (1997); (c) frequency distribution of the number (nb) of disturbance events (left, bars) and the distribution of the number (nb) of trees by decade (right, line); (d) frequency distribution of mortality dates; and (e) residuals of the log-linear regression on the age frequency distributions of release events. In mortality garph, * = dates from archaeological wood pieces.. 2017 Journal of the North Atlantic No. 31 N. Roy, N. Bhiry, J. Woollett, and A. Delwaide 10 Oscillation, whose multidecadal waveform variation is ~40–60 years (D’Arrigo et al. 2003). δ18O proxy temperature data from the GISP2 core in is 3.5 years in Labrador (D’Arrigo et al. 2003). In addition, a 10-year mean window ought to be short enough to avoid correlation with the North Atlantic Figure 4. Correlation diagram for the last 350 years at Uivak Point: (a) occupation periods of the site and surrounding area; (b) cold climate periods from Meese et al. (1994) and Overpeck et al. (1997); (c) frequency distribution of the number (nb) of disturbance events (left, bars) and the distribution of the number (nb) of trees by decay (right, line); (d) frequency distribution of mortality dates; and (e) residuals of the log-linear regression on the age frequency distributions of release events. In mortality garph, * = date from archaeological wood pieces. Journal of the North Atlantic 11 2017 No. 31 N. Roy, N. Bhiry, J. Woollett, and A. Delwaide authors also showed that bark beetle activity, which had been present along with related blue-stain fungi since the 18th century, became so widespread in the 20th century that it was linked to extensive waves of mortality affecting the oldest trees in the 1970s, the 1980s, and especially the 1990s. Similar bark beetle infestations may also explain the high mortality in our chronology between 1970 and 2000 when bluestain fungi were observed in our samples. In order to distinguish bark beetle disturbance from anthropogenic disturbance, an entomological study of soil and peat sediment in the Oakes Bay forest should be carried out. Such research would make it possible to determine more precisely when bark beetle outbreaks occurred (e.g., Bhiry and Filion 1996). Anthropogenic disturbances Disturbances resulting from wood harvesting by humans were documented along the eastern coast of Hudson Bay at Wapmagoostui-Kuujjuarapik by Delwaide and Filion (1987). That study illustrated the significant impact of humans on forest composition and structure in northern environments. The treering study presented here demonstrated that release events have occurred during cold climate periods as well as during clement ones; in other words, the release events had little correlation with climatic trends (Figs. 3, 4). Both of the periods of disturbance (AD 1500 to 1640 and 1690 to 1750) observed in the Dog Island samples coincide with periods when Inuit occupied archaeological sites adjacent to the study area, most notably the Oakes Bay 1 site. While dendrochronological analysis could be performed on only a limited sample of well-preserved archaeological wood specimens, this analysis was enough to demonstrate that the site’s occupants probably harvested wood directly from the studied forest. Dendrochronological dates (Table 3) combined with archaeological artifact dates and historical records related to the occupation of the Oakes Bay 1 site suggest that local tree harvesting may well have occurred between the years A.D. 1681 and 1771. A rather longer history of cutting is in fact likely, due to the presence of other winter settlements and poorly documented seasonal camps in the locality dating between the 15th century and the 1970s (Kaplan 1983, Roy et al. 2012, Woollett 2010), all of which had access to the same forest. The relatively close clustering of these dates (AD 1681 to 1764) leads us to conclude that wood present in the Oakes Bay site was collected from the forest surrounding the archaeological site. If driftwood had been extensively used as a building material, a wider dispersion of tree ages reflective of the more random transport and Greenland indicate that there were colder climatic conditions ca, A.D. 1200, 1500, and 1800, whereas warmer conditions arrived ca. A.D. 1400 and 1700 (Meese et al. 1994). The Labrador tree-ring width record suggests that there were cooling periods in the 1600s to early 1700s and in the 1800s, but a warming period in the middle to late 1700s. Based on other paleoecological data, a warming trend was also documented from the late 1800s through the mid-20th Century (Overpeck et al. 1997). According to these data, climate does not appear to be a major cause of the growth releases observed in this study because the majority of release events are scattered widely throughout the chronology rather than clustering around phases of temperature change. Non-anthropogenic disturbances impact on forest dynamics Recent studies of forest dynamics in subarctic Canada have demonstrated the importance of nonanthropogenic disturbances such as fire and beetle outbreak on forest dynamics and tree growth in subarctic Canada, especially in marginal forest contexts (Caccianiga et al. 2008). According to Caccianiga et al., the role of abiotic and biotic disturbances should not be underestimated. They can have a significant impact at the local scale on the composition and the structure of woodland stands and must be considered in the study of the dynamics of these marginal forests, especially in the subarctic. We did not find any clear evidence of fire such as a charcoal layer in soil or fire scars on trees in the study sites. However, signs of resin pockets and blue-stain fungi indicate that bark beetle outbreaks were involved in forest disturbances in the Dog Island and Uivak Point sites and likely contributed to a number of release events. Evidence of bark beetle activity was widespread at both sites, but the timing and magnitude of each beetle attack differed. At Uivak Point, only bluestain fungi were observed, and their distribution was concentrated between 1980 and 2000, which is in accordance with Payette (2007). At Dog Island, indices of bark beetle outbreak were more pronounced. Our results suggest that the insect has been present for a long time (since 1790) and that its impact seems to be greater today. The distribution of resin pockets and blue-stain fungi shows an important increase in frequency during the decades following 1800, 1910, and 1920, and between 1970 and 2000. Similar data were obtained on the east coast of Hudson Bay by Caccianiga et al. (2008), who found a high frequency of occurrence of resin pockets in tree-rings dated to 1861, 1909, 1914, and 1951 and a high frequency of blue-stain fungi between 1970 and 1990. These 2017 Journal of the North Atlantic No. 31 N. Roy, N. Bhiry, J. Woollett, and A. Delwaide 12 to represent the collapsed roof structure of the most recent phase of construction (and hence occupation) of that house. It was dated using 4 different unpublished larch chronologies on file at the Dendrochronology Laboratory at the Centre d’études nordiques, Université Laval. All of them indicated a range of 1720–1825, which confirms the best statistical possibilities for the date. This new information suggests that 18th- and early 19th-century occupation histories of some Labrador Inuit sites that were gleaned from summaries of Moravian Mission records may be incomplete and need to be verified against independent archaeological, dendrochronological, or other pertinent data sources. In this case, artifacts of European origin recovered in earlier test excavations of House 6 are consistent with an occupation dated to A.D. 1825 or shortly thereafter, even though they are inconclusive (Woollett 2003).A small number of artifacts recovered in the 2010 excavation, including wodd pieces, support this interpretation. At Uivak Point, the frequency of disturbance events seems less significant than at Dog Island due to the low number of wood samples analyzed. However, the data trends in the same direction as the data from Dog Island. In particular, the frequency of disturbance events also seems to correspond to the Inuit occupation period. The beginning of the 20th century is also marked by high levels of disturbance, which may be linked to the construction of 2 wood cabins at the nearby Uivak Point archaeological site in the late 19th or early 20th century (Woollett 2003). Conclusion Reconstructing disturbance regimes by using a dendroecological approach can provide valuable data to supplement or substantiate existing information regarding forest dynamics obtained from other paleoenvironmental sciences. By coupling data from this approach to historical and archaeological data, it becomes possible to document long-term disturbance patterns, even where previous studies have concluded that the forest dynamic is primarily affected by climate. This study demonstrated that the role of anthropogenic disturbance was very significant at the local scale in old-growth forests around the Oakes Bay 1 archaeological site on Dog Island. Wood-harvesting had a great impact on the open forest and should be carefully considered in the study of forest dynamics in the North. Today, the Oakes Bay forest is sparsely treed and appears to be, at first glance, a marginal relict forest isolated in a tundra environment. However, our study of tree-ring growth in wood sampled from the forest indicates deposition of flotsam on beaches would likely have been observed, as has been recently demonstrated at the Qijurittuq Site (IbGk-3) on Drayton Island, northern Québec (Lemieux et al. 2011). The presence of considerable quantities of partially preserved wood (which was unsuitable for dendrochronology) throughout the Oakes Bay 1 site suggests that wood harvesting was a regular and substantial activity. Plant macrofossil analysis has also demonstrated anthropogenic impacts (tree cutting) at the Oakes Bay 1 (Dog Island) site, beginning sometime after ca. 610 B.P. (AD 1309–1361) and continuing until ca. 300 B.P. (the late 18th century) (Roy et al. 2012). This use of the site over the long term had an impact on local wood resources due to the extensive amount of wood required to build and heat their houses (Roy et al. 2012). This study suggests that episodes of growth release documented from A.D. 1580 to 1750 coincide with anthropogenic disturbances in the form of wood harvesting. Sustained wood harvesting in the relatively sparse local subarctic forest would have quite easily generated a significant canopy gap that likely increased the amount of resources for the remaining trees, especially light. Light is one of the resources that is capable of stimulating growth-release events and is widely associated with disturbance events in the forest dynamic (Payette 2010). Disturbance events occurred frequently after A.D. 1820, with our data showing a maximum disturbance at the beginning of the 20th century. These observations suggest that the local forest continued to be harvested, and new release events continued to be generated by the presence of new canopy gaps, well after the Oakes Bay site was abandoned in the 18th century. This situation can be explained by the construction of a new winter site ca. A.D. 1820–1830, followed by the construction of wood cabins in the 20th century at Evilik Bay, located at the eastern extremity of Dog Island (Fig. 1). Today, northern Dog Island is still frequented by Inuit for activities such as wood harvesting, fishing, and berry picking. A different scenario of forest disturbance is portrayed at Uivak Point, however. The A.D. 1720–1825 dates obtained from the wood sample in House 6 at Uivak Point indicate that the structure was built and occupied 18 or more years after the most recent historical mention of the winter village’s occupation in Taylor and Taylor’s (1977) translation and synthesis of Moravian mission documents. This tamarack (eastern larch) specimen was recovered from a partially frozen deposit overlying the floor of the entrance passage in House 6. The deposit appears Journal of the North Atlantic 13 2017 No. 31 N. Roy, N. Bhiry, J. Woollett, and A. Delwaide cline in Eastern North America linked with phytophagous insect activity. Quaternary Research 45:312–320. Brice-Bennett, C. 1977. Our Footprints are Everywhere: Inuit Land Use and Occupancy in Labrador. Labrador Inuit Association, Nain, NL, Canada. 380 pp. Caccianiga, M., S. Payette, and L. Filion. 2008. Biotic disturbance in expanding subarctic forests along the eastern coast of Hudson Bay. New Phytologist 178:823–834. Canham, C.D., and P.L. Marks. 1985. 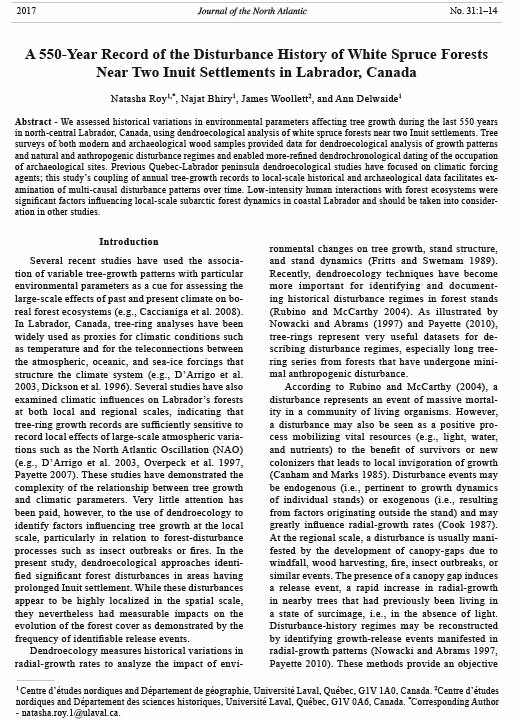 The response of woody plants to disturbance: patterns of establishment and growth. Pp 198–217, In S.T.A. Pickett and P.S. White (Eds.). The Ecology of Natural Disturbance and PatchDynamics. Academic Press, San Diego, CA, USA. Cook, E.R. 1987. The decomposition of tree-ring series for environmental series. Tree-ring Bulletin 47:37–59. Cox, S. 1977. Prehistoric settlement and cultural change at Okak, Labrador. Ph.D. Dissertation. Harvard University, Cambridge, MA, USA. Crumley, C.L. 1994. Historical ecology: A multidimensional ecological orientation. Pp. 1–16, In C.L. Crumley (Eds.). Historical Ecology: Cultural Knowledge and Changing Landscapes. School of American Research Press, Santa Fe, NM, USA. 284 pp. D’Arrigo, R., B. Buckley, S. Kaplan, and J.M. Woollett. 2003. Interannual to multidecadal modes of Labrador climate variability inferred from tree-rings. Climate Dynamics 20:219–228. Delwaide, A., and L. Filion. 1987. Coupes forestières par les Indiens et par la Compagnie de la Baie d’Hudson à Poste-de-la-Baleine, Québec subarctique. Géographie physique et Quaternaire 41:87–96. Dickson, R., J. Lazier, J. Meincke, P. Rihines, and J. Swift. 1996. Long-term coordinated changes in the convective activity of the North Atlantic. Progress in Oceanography 38:241–295. Efron, B. 1979. Bootstrap methods: Another look at the jackknife. Annals of Statistics 7:1–26. Filion, L., S. Payette, L. Gauthier, and Y. Boutin. 1986. Light rings in subarctic conifers as a dendrochronological tool. Quaternary Research 26:272–279. Fritts, H.C., and T.W. Swetnam. 1989. Dendroecology: A tool for evaluating variations in past and present forest environments. Advances in Ecological Research 19:111–188. overnemnt of Canada. 2013. Historical data. Available online at http://climate.weather.gc.ca/historical_data/ search_historic_data_e.html. Accessed 14 November 2013. Government of Canada. 2015. Historical climate data. Available online at http://climat.meteo.gc.ca/index_f. html . Accessed 20 January 2015. Grissino-Mayer, H.D. 2001. Evaluating crossdating accuracy: A manual and tutorial for computer program COFECHA. Tree-ring Research 57:205–221. Guiot, J. 1990. Methods and Programs of Statistics for Paleoclimatology and Paleoecology. Quantification des Changements Climatiques. Méthodes et Programmes. Monographie 1. Institut National des Sciences de l’Univers, Programme national d’Études des Climats. Aix-en-Provence, France. 253 pp. that this impression is illusory. Dendrochronological analyses date Inuit wood harvesting to periods when the disturbances creating growth releases were initiated. Therefore, the forest dynamics of this particular subarctic forest are dominated by a history of frequent release events that coincide with Inuit occupation and with sustained harvesting and the attendant creation of canopy gaps. Compared to the effect of human activities, climate change did not have as great an impact on forest dynamics at this site. This case study provides a useful example of the necessity of adopting a broad frame of reference for ecological studies in “pristine” contexts where humans have long histories of occupation. In this case, a bilateral historical ecology perspective (Crumley 1994) on human environmental interactions provided a fruitful means of understanding the forest dynamics and succession of a coastal subarctic region. The documentation of past disturbance patterns is primordial for understanding how presentday forests developed over the recent past and how they might change in the future. Acknowledgments We thank Elie Merkuratsuk and Pier-David Garant for their assistance in the field. We are also grateful for the work of the 2010 Uivak field crew and the help of the Webb family, Tom Sheldon (Director of Environment for the Nunatsiavut Government), and the community of Nain. Thanks are also extended to Andrée-Sylvie Carbonneau for mapping assistance and Richard Vermette for help with statistical analysis. This project was supported by grants from the Fonds Québécois de la recherche sur la société et la culture (FQRSC) supporting the Archeometry research group of Université Laval, the Fonds Québécois de la recherche – Nature et Technologie (FQRNT) Doctoral research scholarships, the Government of Canada Program for International Polar Year, the Natural Sciences and Engineering Research Council of Canada (NSERC), and the Northern Scientific Training Program (Indian and Northern Affairs Canada). Literature Cited Alix, C. 2005. Deciphering the impact of change on the driftwood cycle: Contribution to the study of human use of wood in the Arctic. Global and Planetary Change 47:83–98. Berg, E.E., J.D. Henry, C.L. Fastie, A.D. De Volder, and S.M. Matsuoka. 2006. Spruce beetle outbreaks on the Kenai Peninsula, Alaska, and Kluane National Park and Reserve, Yukon Territory: Relationship to summer temperatures and regional differences in disturbance regimes. Forest Ecology and Management 227:219–232. Bhiry, N., and L. Filion. 1996. Mid-Holocene hemlock de2017 Journal of the North Atlantic No. 31 N. Roy, N. Bhiry, J. Woollett, and A. Delwaide 14 Guiot, J., and A. Nicault. 2010. Méthodes de dendroclimatologie à l’échelle continentale: Fonctions de réponse et fonctions de transert. Pp. 229–254, In S. Payette and L. Filion (Eds.). La Dendrochronologie: Principes, Méthodes et Applications. Presses de l’Université Laval, Québec, QC, Canada. 758 pp. Holmes, R.L. 1983. Computer-assisted quality control in tree-ring dating and measurement. Tree-ring Bulletin 43:69–78. Kaplan, S.A. 1983. Economic and social change in Labrador Neo-Eskimo culture. Ph.D. Dissertation. Bryn Mawr College, Bryn Mawr, PA, USA. 906 pp. Kaplan, S.A. 2012. Labrador Inuit ingenuity and resourcefulness: Adapting to a complex environmental, social, and spiritual environment. Pp. 15–42, In D. Natcher, L. Felt, and A. Procter (Eds.). Settlement, Subsistence, and Change among the Labrador Inuit: The Nunatsiavummiut Experience. University of Manitoba Press, Winnipeg, MB, Canada. 286 pp. Kaplan, S.A., and J.M. Woollett. 2000. Challenges and choices: Exploring the interplay of climate, history, and culture on Canada’s Labrador coast. Arctic, Antarctic, and Alpine Research 32:351–359. Kleivan, H. 1964. Acculturation, ecology, and human choice: Case studies from Labrador and South Greenland. Folk 6:63–74. Lamb, H.F. 1985. Palynological evidence for postglacial change in the position of tree limit in Labrador. Ecological Monographs 55:241–258. Lemieux, A-M., N. Bhiry, and P.M. Desrosiers. 2011. The geoarchaeology and traditional knowledge of winter sod houses in eastern Hudson Bay, Canadian Low Arctic. Geoarchaeology 26:479–500. Lemus-Lauzon, I., N. Bhiry, and J. Woollett. 2012. Napâttuit: Wood use by Labrador Inuit and its impact on the forest landscape. Études/Inuit/Studies 36:113–137. Meese, D.A., A.J. Gow, P. Grootes, M. Stuiver, P.A. Mayewski, G.A. Zielinski, M. Ram, K.C. Taylor, and E.D. Waddington 1994. The accumulation record from the GISP2 core as an indicator of climate change throughout the Holocene. Science 266:1680–1682 Morneau, C., and S. Payette. 2000. Long-term fluctuations of a caribou population revealed by tree-ring data. Canadian Journal of Zoology 78:1784–1790. Nishimura, P. 2009. Dendroclimatology, dendroecology, and climate change in western Labrador, Canada. M.Sc. Thesis. Mount Allison University, Sackville, NB, Canada. 126 pp. Nowacki, G.J., and M.D. Abrams. 1997. Radial-growth averaging criteria for reconstructing disturbance histories from presettlement-origin oaks. Ecological Monographs 67:225–249. Overpeck, J., K. Hughen, D. Hardy, R. Bradley, R. Case, M. Douglas, B. Finney, K. Gajewski, G. Jacoby, A. Jennings, S. Lamoureux, A. Lasca, G. MacDonald, J. Moore, M. Retelle, S. Smith, A. Wolfe, and G. Zielinski. 1997. Arctic environmental change of the last four centuries. Science 278:1251–1256. Payette, S. 2007. Contrasted dynamics of northern Labrador tree lines caused by climate change and migrational lag. Ecology 88:770–780. Payette, S. 2010. Dendroécologie des forêts. Pp. 351–413, In S. Payette and L. Filion (Eds.). La Dendrochronologie: Principes, Méthodes, et Applications. Presses de l’Université Laval, Québec, QC, Canada. 758 pp. Payette, S., L. Filion, L.Gauthier, and Y. Boutin. 1985. Secular climate change in old-growth tree-line vegetation of northern Quebec. Nature 315:135–138. Roy, N., N. Bhiry, and J. Woollett. 2012. Environmental change and terrestrial resource use by Thule and Inuit of Labrador, Canada. Geoarchaeology 27:18–33. Rubino, D.L., and B.C. McCarthy. 2004. Comparative analysis of dendroecological methods used to assess disturbance events. Dendrochronologia 21:97–115. Short, S.K., and H. Nichols. 1977. Holocene pollen diagrams from subarctic Labrador-Ungava: Vegetational history and climatic change. Arctic, Antarctic, and Alpine Research 9:265–290. Statistics Canada. 2012. Nain, Newfoundland and Labrador (Code 1011035) and Newfoundland and Labrador (Code 10) (table). Census Profile. 2011 Census. Statistics Canada Catalogue no. 98-316-XWE. Ottawa. Released 24 October 2012. Available online at http:// www.12.statcan.gc.ca/census-recensement/2011/dppd/ prof/index.cfm?Lang=E. Accessed 19 October 2015. Taylor, J.G. 1974. Labrador Eskimo Settlements of the Early Contact Period. National Museums of Canada, Publications in Ethnology 9, Ottawa, ON, Canada. 102 pp. Taylor, J., and H. Taylor. 1977. Inuit land use and occupancy in the Okak region, 1776–1830. Pp. 59–81, In C. Brice-Bennett (Ed.). Our Footprints are Everywhere: Inuit Land Use and Occupancy in Labrador. Labrador Inuit Association, Nain, NL, Canada. 380 pp. The survivors. 1986. Them Days 11.3:49–63. Woollett, J. 2003. An historical ecology of Labrador Inuit culture change. Ph.D. Dissertation. City University of New York, New York, NY, USA. 698 pp. Woollett, J.M. 2010. Oakes Bay 1: A preliminary reconstruction of a Labrador Inuit seal hunting economy in the context of climate change. Geografisk Tidsskrift- Danish Journal of Geography 110:245–259. Zasada, J.C. 1984. Site classification and regeneration practices on floodplain sites in interior Alaska. Pp. 35–39, In M. Murray (Ed.). Forest classification at high latitudes as an aid to regeneration. USDA Forest Service, General Technical Report PNW-177. Pacific Northwest Forest and Range Experiment Station, Portland, OR, USA.